A day off and word reached me that royal train driver and superstar DB train jockey Adrian Nichols was in charge of 4S35. This news prompted me to go to the great effort of making the 300 yard trip to witness his passing. 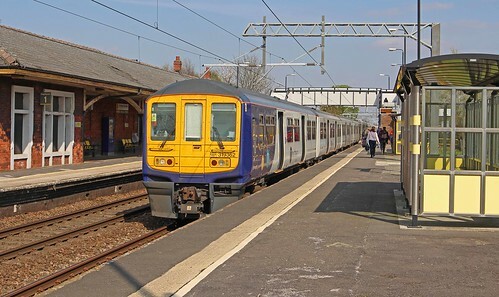 Class 319's might not be the latest in gee whizz technology and may not be good enough for darn sarf but ooop north they're considered very much the way to travel. I like them, they certainly whip along and beat a pacer or sprinter. 319362 pauses at St Helens Junction at 15.01 (4 late) on Tuesday 9th April 2019. The unit is forming 2F17 the circuitous 1318 Crewe to Liverpool Lime Street service.